The story began back in the year 2007 with the release of 308, introduced then as the successor to 307. 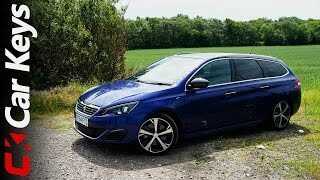 Moving with the time and looking at the advancements in cars releasing every year Peugeot decided to bring GT version to 308 and like this for the 2015 model year buyers get this all new revised treat, Peugeot 308 GT 2015. 308 GT 2015 comes with the option of diesel or gasoline engines and with them carry more power and sporty look beneath the hood. 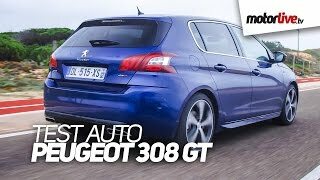 Let us know more about the specifications and features installed in Peugeot 308 GT 2015. The interior of Peugeot 308 GT 2015 gets a class ahead with black inside getting illuminated red lights. The dynamic interior of the standard version comes with the Alcantara/TEP or Nappa Leather work contrast with red stitching. The same pattern gets followed till the dashboard, floor mats, door panels and gear lever, while the ancestor pedals gets redesigned by the introduction of Aluminum pedals. The compact steering wheel of Peugeot 308 GT is leather wrapped accompanying beside him all new touch screen instrument panel following the same contrast of red and black. Last but ‘to be mentioned’ features in all new 308 GT 2015 are the Dynamic Cruise Control, Blind Spot monitoring and Emergency collision braking. 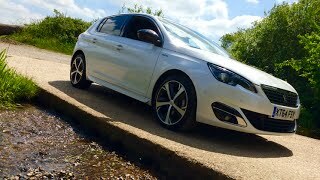 The exterior of Peugeot 308 GT 2015 comes with sportive looks. The center departing the aggression around the exterior is, the company’s all new trademark grille with three horizontal blades with the mounted ‘Lion Badge’. 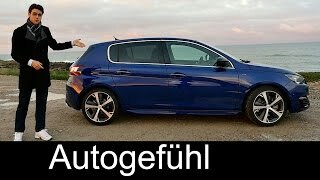 Till date most of the Peugeot 308 models came with an option of full-LED headlights, this change’s this time and the front fascia of standard version gets them. At the rear of Peugeot 308 GT, twin tail pipes accompanied by a GT badge makes the 308 GT stand front in the list of models created by company. Last but no where behind the magnetic blue color exterior gets very well contrasted by the 18” wheels and black window caps, making the model walk another mile in context to dynamic exterior.